Copenhagen: God has given sufficient for human needs, not human greed." On a day when the venue of climate talks became an almost unmanageable jamboree, and it became clear that a solution would be postponed to Mexico City in 2010, a group of influential scientists from China and Germany quoted Mahatma Gandhi and offered the world a solution to cutting global emissions. 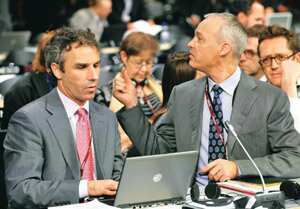 “We are preparing for 2010," US chief climate negotiator Todd Stern said, echoing minister of state for environment Jairam Ramesh. “A legally binding agreement at Copenhagen may not happen; there are huge differences in the negotiating text." The Sino-German proposal focused on simplicity on a day when thousands of ministers and officials of 192 countries—45,000 people registered to enter the 15,000-capacity venue, forcing authorities to impose new restrictions— streamed in and found it hard to agree on basic details of the most complex climate talks yet. The proposal’s bottom line: India’s carbon budget has 80 years to run out, China’s 23 years, the US is already at minus three, and Africa has several hundred years. “So you see, it forces responsibilities and time frames on governments," said Pan Jiahua, a frequent adviser to Chinese Premier Wen Jiabao and director of Beijing’s Institute for Urban and Environmental Studies. “We have presented this to the Chinese government, and it gives no preference to us, but it is the only way." Asked if China, the world’s biggest polluter, would accept a national carbon budget, Pan said: “Our negotiators have told us nothing new can be initiated in Copenhagen. Post- Copenhagen, it certainly can be." Pan’s view was shared by Dirk Messner, head of the German government’s Climate Change Advisory Council. “I advise the German government, and we too have been told this can be taken on board after Copenhagen," Messner said. The proposal fixes the global carbon budget in gigatonnes, with the exact amount up for negotiation. It recognizes negotiating principles that developing countries hold dear (per capita emissions and historical responsibility), and brings to the table the Western view that developing countries must do more. “In 23 years, China will have to move to low-carbon development or buy carbon credits, so it forces responsibility," said Pan, who quoted the chief Japanese negotiator as saying the proposal was “simple and workable". That view could not be independently verified. The proposal uses 1990— when climate change was first recognized—as a base year for all calculations. “If we use 2009, 23 years is all the global budget will last," said Messner. The proposal takes into account emission rights and future budgets, and says global emissions must peak “very rapidly" and then be brought down year by year. The peaking year will need to be agreed on, either 2015 or 2020. One of the experts used a metaphor to explain the global carbon budget. “Some guests arrive first and eat some slices, while others come later and find the pizza isn’t enough," said Chayun Tantivasadakarn, an economist and vice-dean at Bangkok’s Thammasat University. “We need to take into account those who have already eaten. They get less, and they have a responsibility to make sure the others get enough."